Anwar Hossain Manju translates autobiography of Khuswant Singh Truth Love and Little Malice. Khuswant Singh is a popular writer in Bangladesh. When we begin to read his book, we can not stop reading. He writes continued more than fifty years. He is also writer, journalist and editor. His autobiography is written on his life and work. He was born in 1915. Khushwant Singh writes about his life story with steadily. Khuswhant Singh was born in Hadali. His father name is Sir Sobha Singh. He writes his experience of more than sixty years of his life of the joy and frustration. He writes about many people who are established in politics and he write about them the truth about the unknown of them. There is no doubt that these people will be angry and from their angry, he became the victim. 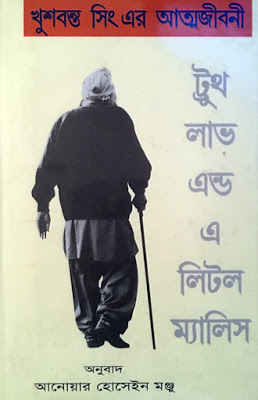 If you want to get the Bangla onubad or Bangla translation of the autobiography of Khusowant Singh named Truth Love and Little Malice, you are required to click here!